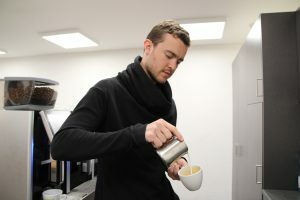 Eversys was founded in Switzerland in 2009, and its vision has remained the same since it began; to seamlessly bridge the gap between traditional coffee equipment and super automatic intelligence, creating quality coffee in the cup every time. Eversys’ range of machines already offers barista-quality coffee and true espresso at the touch of a button. But soon, the Swiss-based innovator will be unveiling the next generation of espresso machines. This new machine is expected to take super-automation to the next level, further fulfilling the Eversys vision. Champion barista, and Barista Hustle founder, Matt Perger, has been working in collaboration with the Swiss company since earlier this year. An influential voice in the world of coffee, Matt believes that super-automation is the future, and both baristas and businesses will benefit. To Eversys, this is what the next generation can achieve. Not only quality coffee at the touch of a button, but a freedom for baristas. Super-automation gives baristas time; time to discover more about the drink they create, perfect their personal touches and communicate with fellow coffee-lovers. While the machine creates a delicious drink every time, the barista completes the full coffee experience. For operators, the benefits from Eversys’ super-automation continue. Drinks remain consistent, labour costs are lowered and productivity stays high. Their innovative e’Connect technology provides invaluable transparency, giving information on productivity, technical performance and drinks profiles, and allowing stakeholders the freedom to modify their machine’s parameters remotely. The next generation of Eversys espresso machines is coming, with a new machine due to launch in October. As the Swiss company continues to bridge the gap between tradition and technology, the world of coffee looks set to change. As professional coffee machine sponsor of the Allegra CEO Forum, we are delighted to announce that Eversys will be previewing its new machine at this year’s event.